Of course, water has to be clean. But chemically pure water can be deadly – if drunken in greater volume…. Therefore it not only the task to „clean“ the water, but to put it into a natural „spring water“ state again, to enable the water to fulfill its biological tasks. Actually it is not „only“ the pollution, which is most dangerous for the water, it is the guiding of water in tubes under relatively high pressure. 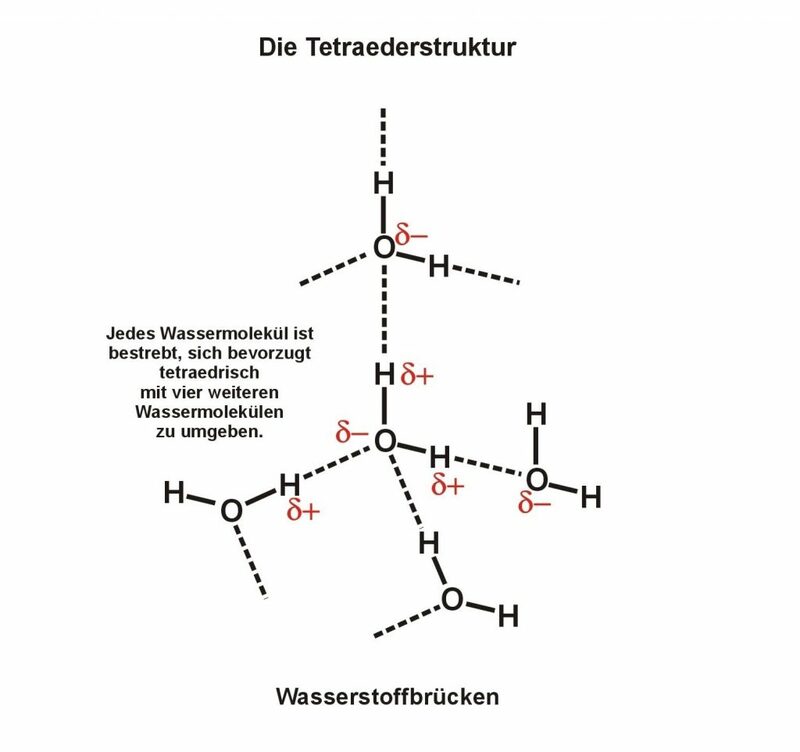 So there are coming up „clusters“, the water is not anymore as fine as natural water and is not anymore able to get in the very fine structures of the cells. Science never has done studies to this very important aspect to find out the related relationships. 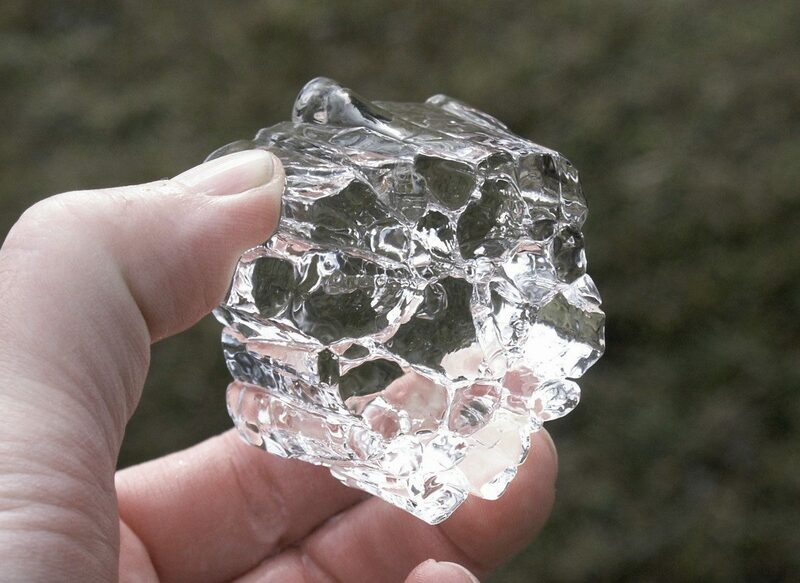 If the water is renatured, it gets back all its life-protecting functions and gets back its liquid cristalline structure – this is than a very stable state. It is called also „structured water“. The molecules of the water have a weak polarity, because the two hydrogene atomes of the molecule lead to a slightly positive effect outside. Therefore there is a magnetic effect and the molecules like to connect to each other by means of hydrogen bonds. Thus threedimensional structures are built with prefereably tetrahedral elements. 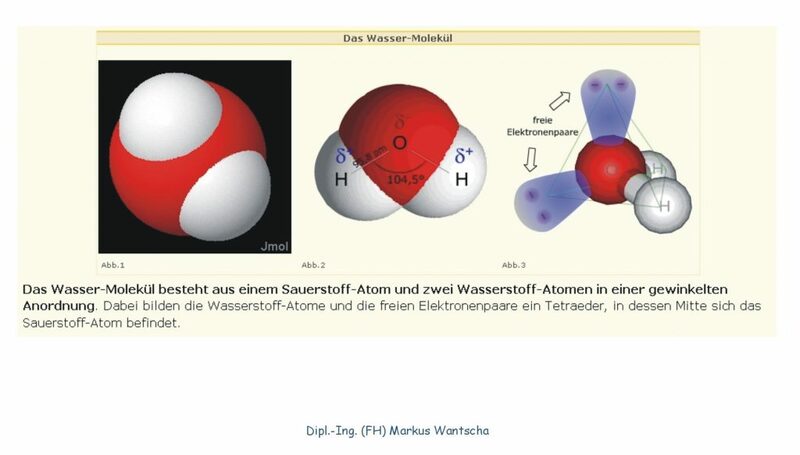 The hydrogen bonds are the basis of the memory-effect of the water. Cluster with beautiful structures appear only in orderly water, as the Japanese Masaro Emoto has documented by his famous crystal photography. These clusters normally do not build fixed structures, they connect and disconnect continously caused by environmental influence and pick up the related informations of the surrounding – to change this immediately with the next influence. In waterpipes under pressure the size of the clusters increases. The informative influences of the surrounding are – in contrary to electromagnetic fields – not stopped by metalic shieldings! They go through the water pipes dirctly into the water and get fixed into the memory of the water.. In consequence of all this influences the „normal“ tap water – in spite of it is chemically more ore less clean and physiologically harmless – is molecular clumped and through uncountable civilisatory influences informatically confused. Accordingly its behaviour is completely different to water from a so called „holy well“ or a real clean and undisturbed river. In consequence it is necessary, the negative effects of our civilisatory „treatment“ as pollution, line pressure and harmful infomations to lead back to the primordial state and to ad positive informations to stabilize this very important primordial state. If the water has recoverd the spring water status, it is molecular much better available for the cellular activities and accellerates some biological processes. It is also more effective in detoxification and also again able to get into fine and hard cartilage. Only by drinking such „refreshed“ water a beginnig arthrosis in my right knee was not only stopped but fully recoverd – and this is now 10 years ago! And there is another astonishing effect – I do not get anymore real aching with sportive efforts! I’m running 10 km distance without any problems, even if I have done 3 month of pause! In summary, this are typical characteristics of „holy wells“. And this characteristics can be reached even from tap water by means of exclusively physically methods of treatment.